"Evaṁ paramparā prāptam (BG 4.2), if you have got connection with the original powerhouse, then there is electricity. Otherwise it is simply wire. What is the value? Simply wiring will not help you. The connection must be there. And if you lose the connection, then it is of no value. Therefore Kṛṣṇa consciousness movement means you have to keep yourself always connected with the original powerhouse. And then wherever you'll go, there will be light. There'll be light. If you're disconnected, there will be no light. The bulb is there; the wiring is there; the switch is there. Everything is there. That's how Arjuna is feeling, that 'I am the same Arjuna. I am the same Arjuna who fought in the Battlefield of Kurukṣetra. I was known as so great a warrior, and my bow is the same bow, and my arrow is the same arrow. But now it is useless. 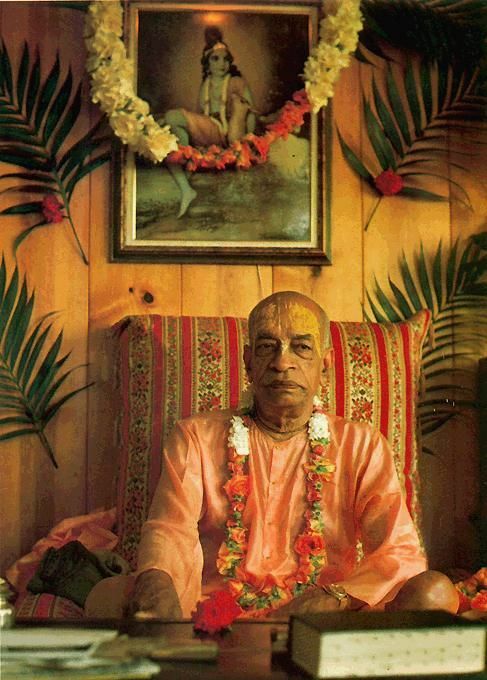 I could not defend myself, because disconnected with Kṛṣṇa. Kṛṣṇa is no longer.' Therefore he began to remember the words of Kṛṣṇa which was taught to him in the Battle of Kurukṣetra. Kṛṣṇa is not different from His word. That is absolute. What Kṛṣṇa said five thousand years ago, if you catch up those words again you're immediately connected with Kṛṣṇa. Immediately. This is the process. Just see Arjuna. He says that evaṁ cintayato jiṣṇoḥ kṛṣṇa-pāda-saroruham (SB 1.15.28). When he began to think of Kṛṣṇa and His instruction as again, in the battlefield, immediately he become śānta, peaceful. Immediately pacified. This is the process. We have got intimate relationship with Kṛṣṇa, eternally. It is not artificial. Therefore if you keep ourself always connected with Kṛṣṇa, there will be no more disturbance. Peaceful. Yaṁ labdhvā cāparaṁ lābhaṁ manyate nādhikaṁ tataḥ (BG 6.22). If you get that position, then that is the highest benefit, highest gain, yaṁ labdhvā ca, then you will not desire for any other gain. You'll perceive that 'I have got the highest gain.' Yaṁ labdhvā cāparaṁ lābhaṁ manyate nādhikaṁ tataḥ, yasmin sthitaḥ (BG 6.22)... and if you keep yourself fixed up in that position, then guruṇāpi duḥkhena na..., even the heaviest type of calamities, you'll not be disturbed. That is peace. That is peace. Not that little pinching, you are disturbed. If you're actually fixed up in Kṛṣṇa consciousness, you'll not be disturbed in the greatest form of dangerous condition. That is the perfection of Kṛṣṇa consciousness."